There are many kinds of leaders. Each of which subscribe to their own philosophy and approach to leadership. In this article, we will compare two types of leaders: Positional Leaders and Persuasive Leaders. We will explain the key traits each type of leader possess and how they succeed or fail to influence others. Being able to distinguish between these two types of leaders is crucial to being a better leader. Allowing you to align your skills and abilities in order to effectively lead others. Conversely, being able to distinguish between positional and persuasive leaders will help you identify the types of leaders that produce successful outcomes – wherever they lead. So without further ado, let us begin. Positional leaders, use their title as a tool to impose authority and control. While this approach to leadership can influence others, it does not foster effective long-term working relationships. Instead, it often disenfranchises people and prevents them from expressing their ideas and opinions. Many traits of a positional leader are due to their lower emotional intelligence compared to persuasive leaders. Positional leaders may also perceive and/or treat others as lesser. Especially if they are ‘below’ them in an organizational hierarchy. Additionally, they may manipulate others in order to acquire influence. Further reducing the integrity and the trust others place in them. These traits demonstrate that they invest very little into the building and maintaining of positive relationships. In some cases, they can damage the self-esteem of the people they lead. Additionally, they lack open, honest and respectful communication skills. Favoring singular selfish personal gain instead of overall outcomes. This can destroy the moral and cohesion of an organization and make them seem unresponsive to this positional ‘leaders’ efforts. Finally, positional leaders often employ tactics to coerce others or use their power as a weapon to gain influence. The end game of the positional leader is loss of respect by those the attempt to lead. Teams and other leaders in the organization most often disengage and the organization fails to meet its goals and objectives. Positional leaders are at odds with organizations that want successful leadership. The primary objective of a leader is to direct others in order to achieve a common goal. Persuasive leaders accomplish this by utilizing their own skills and abilities to influence others. They don’t use their position, title and power within an organization to control and manipulate others. Persuasive leaders do not need to control and coerce to achieve their desired outcomes. Instead, persuasive leaders influence others by empowering them and building positive rapport with them. The outcome is that others trust them and vest in their decisions. They willingly follow a true leader who has earned their trust and respect. Persuasive leaders also understand and value the importance of good communication. They allow communication channels to be open, honest and respectful. Encouraging others to share their ideas and opinions, while respectfully communicating their own. This develops effective working relationships and improves team cohesion. Unlike positional leaders, persuasive leaders often possess high emotional intelligence. They exhibit this by showing they value and respect others. Their actions speak to their character. Furthermore, persuasive leaders can influence with or without formal control or authority over resources or people. They strive to improve overall outcomes which are usually determined by their own skills and attributes, rather than their position. In essence, persuasive leaders do not use their position as a weapon to coerce or manipulate others. They instead build positive relationships based on respect, open honest communication and hence gain the trust of others. In my two decades in the consulting world, I’ve seen my fair share of unsuccessful positional leaders. Most often they asked me why their staff or peers failed to engage in their outlined objectives. They wondered why their lack of EI (emotional intelligence) and communications skills placed a dramatic rift between them and their peers. The poor results they experienced were always blamed on external forces rather than their own lacking leadership. Empower others – The truly powerful leader empowers others. Titles and position mean little when you desire a long term outcome that will be mutually beneficial for you and your organization. Respect others – If we fail to respect others how can we expect them to do the same for us. Hold others in the same high esteem you would want for yourself. Communicate – Honest and open communications are the basis of successful relationships business or otherwise. Practicing active listening and respectful communication goes a long way in building rapport and mutual trust. Build Relationships – Building a relationship with those you want to lead, show that you authentically care about them and the outcomes you collectively seek. Emotional Intelligence – EI is our ability to recognize our emotions and that of others and use that information to guild our thinking and behavior. EI gives you a capacity to see beyond the surface of frustrations, social conflicts of working life and more effectively resolve these for all involved. A truly successful leader looks beyond position, power and control. They persuade other from an authentic, character driven approach of openness, communication and respect. Persuasive leaders succeed while others fail. A larger infographic of Positional vs. Persuasive Leaders is below, please download and share far and wide. Have any positive or negative leadership experience to share? Drop us a comment below. We’d love to hear from you! 8 Responses to "Positional vs. Persuasive Leaders"
Positional Leaders are the business equivalent of “because I said so”. I work in the entertainment industry and there are a lot of those types working in positions of power. This is not an effective way to manage a group, especially a creative one. The truly successful directors are the ones that listen to and value their cast and crew. Absolutely true. =) Thanks for your comments! Most bosses are Position leaders and that is a sad truth. They are the ones who use their position to make people under them feel less important. I hate it but that is a reality. I would never want to be that type of leader. Nice infograph! It sums up the article nicely. I’ve been lucky enough to have quite a few Persuasive Leaders, as well as a few positional leaders. I think generally society is moving away from positional leaders. It’s more productive in the long term of a business to invest in persuasive leaders, and I think businesses are learning this more and more. It’s definitely a good change. I never thought of this! 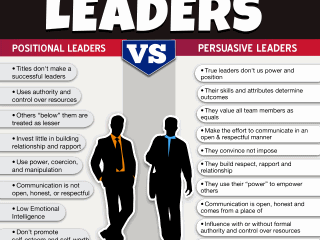 Like I know I have seen and even worth for both types of leaders before but it is amazing that you can pin point the differences. 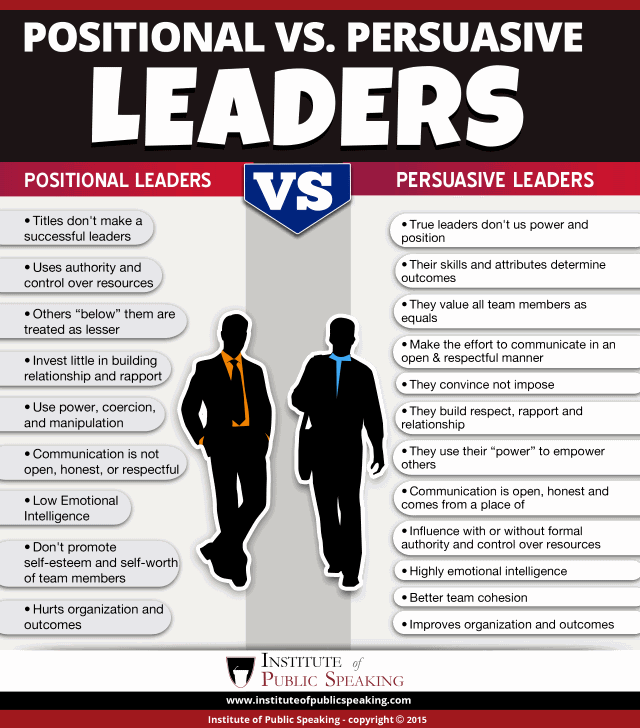 The persuasive leaders are almost always more liked than the positional ones. It seems like even though we know that, there still seems to be a lot more of them. I think this comes down to people wanting to be at the top and not allowing anyone to outshine them. Glad you enjoyed the post. You are correct, sometimes these leaders lack the EI to be able to execute effectively in their role. I have a question… Do you think that positional leaders are taught how to be this way from how they are raised? I know someone, a friend, who runs a small business and he is very hard on his employees. I remember when we were younger his parents were all over him about being better, working harder, doing what it takes… And I was thinking like, could this be down to how we see the role of a leader, through our parents? I enjoyed the post. Really made me reflect on some things. I am learning more every day from you. Thanks for your comment. Sadly, I think many learn bad habits and never take the opportunity to improve. We all have a capacity to be better leaders but have to unlearn some habits that keep us from leadership success.